At the edge of the beautiful Harz mountains lies this lovely farm in Wulften, a small village between Northeim and Herzberg. 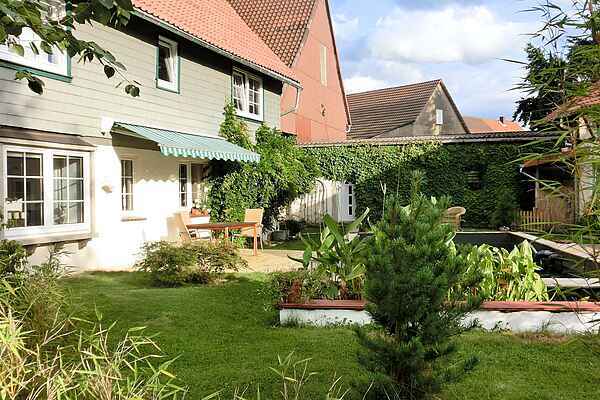 The farm is located in the stunning southern Harz, a gentle hill landscape with fields, meadows and forests. Spend a unique and varied holiday here in this quiet place. This abode is located in a separate building opposite from the farmhouse. A private entrance with a rustic, farm-style staircase and 100 square metres on two levels featuring the original wooden beams demonstrate the uniqueness and cosiness of this apartment. The large room with lots of light, space and a romantic touch will quickly make you forget daily concerns. The landlord operates an idyllic riding school for about 15 horses. The whole complex offers a calm and pleasant atmosphere. Various benches or garden chairs allow for a nice get together and a chat. You're welcome to bring and spend the holiday with your own horse. Stalls for guest horses are available. Riding lessons can be booked as well. Hiking and riding paths are just a short 1-minute walk from the farm. Along with nature and outdoor activities, there are also cultural attractions and interesting towns. Wulften is well connected by buses and trains (it has its own small train station). In the village itself, all the shops for your daily needs are within close proximity. Information and maps on excursion destinations and activities in the Harz region are available in the holiday homes.